We have featured a number of promotional travel accessories in our blog. But, these cartoon custom travel bottles are an excellent addition to your branding campaign. 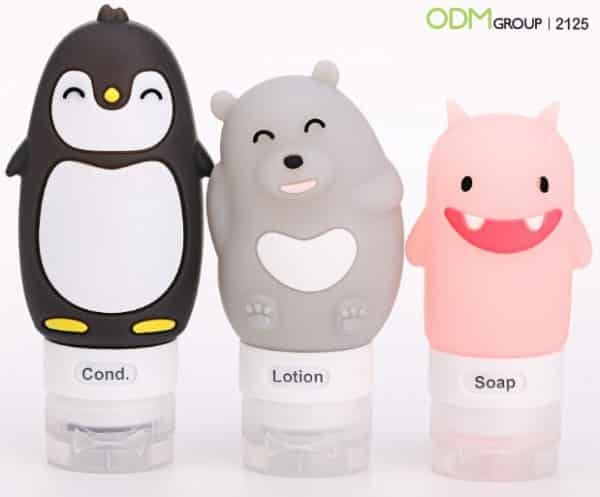 These cartoon-shaped toiletry bottles are ideal for storing liquid soap, lotion, shampoo, and sanitizer. They are a handy travel accessory that your customers will love. Not only will it make packing and traveling a breeze, but it also has huge marketing potential. Easy to Carry: Small and light, these cartoon-shaped toiletry bottles will allow customers to downsize large soap and shampoo bottles. With your brand on the bottle, it can help your brand gain every day exposure. Simple to Use: Silicone body is easy to grip and squeeze. The flip cap makes it easy to fill and dispense shampoo, liquid soap and lotion. With the labels on each bottle, customers will be able to easily identify the contents. Reusable: It’s durable so customers can use them over and over again. Reliable products can improve a brand’s image and ensure long-lasting visibility. Why Use Custom Travel Bottles for Your Project? Customizability: The product is made of silicone, which makes it easy to customize. Clients can fashion it into any shape or design to match their branding campaign. In addition, they can print their logo or brand name on each bottle. This ensures that customers will see your brand every time they use it. Brand Exposure: Because they are designed for traveling, your brand will gain local and international exposure without spending much. Cost-Effective: Like shopping bags and promotional pens, this type of product is not that expensive to produce. Therefore, you can achieve excellent marketing advantage with minimal to medium marketing budget. Versatile: Clients can use this product in so many ways. They can be used as trade show giveaways, gift with purchase for beauty products and travel accessories. Increased Sales: Using the product as a customer incentive will inspire customers to buy more. Fun and attractive designs also keep customers interested in your brand. This new item is an ideal customer giveaway for travel promotions. Marketers can also use them for beauty marketing. Instead of bathing essentials, customers can fill it with body lotion, hand cream, and moisturizer. Aside from cartoon characters, marketers can use popular movie and TV characters. This is ideal as giveaway for special screenings and movie partnerships. Don’t hesitate to contact ODM to check MOQ for custom shape bottles. Send inquiry with product code 2125. Our Mindsparkz team will be more than willing to help you develop interesting and creative designs for your custom travel bottles. For more custom promotional merchandise ideas, visit our blog. Boost your promotions with these cute silicone travel bottles. These custom toiletry bags offer huge marketing and branding potential. the logo can be found on the cover and inside the bag are mini liquid bottles perfect for storing shampoo, shower gel, lotion, and conditioner.